While the war was winding down in 1996, Baskets of Cambodia was one of the first businesses to open up new markets for handcrafted items in Cambodia. With the help and dedication of talented Cambodians, the organization has created a growing business that employs upwards of 400 people each year and has sold over a million products worldwide. They strive to produce eco-friendly products of original design that are labor friendly, and exhibit great craftsmanship and quality. 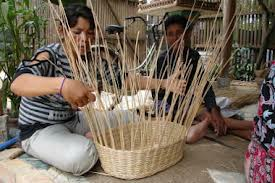 Baskets of Cambodia also is proud to produce higher worker salaries than any other business or charity in Cambodia. STOPstart is a registered fair trade organization committed to building sustainable businesses through training and education. Based around the principle of "Stopping" human trafficking and "Starting" new lives, 30% of STOPstart's workforce has be rescued from slavery, and are being trained in language, design, machining and management. The project is currently funding housing needs for workers as well as expanding workshops in Phnom Penh.